I can imagine that strawberry chiaspread calls up question marks. For convenience you could also call it "strawberry jam", but that is not allowed officially. Fruit spread must contain a certain percentage of sugar to bear the name jam. That sugar is in it as a preservative, but also to give a certain strength to the substance. Chia seeds absorb moisture easily and then turn into a kind of gel. Very useful if you want to make fruit spread. So you have a healthy thickening agent for grabs. Chia seeds have many more advantages: they are a source of fiber. A tablespoon of seeds contains more fiber than a wholemeal sandwich. They are a source of omega 3 fatty acids, they are full of antioxidants and also contain a large amount of calcium, magnesium and iron. These special seeds of the Salvia hispanica, which is family of the mint plant, are grown without pesticides. The plant has a properly functioning, own defense mechanism. Chia seed is black in color and as good as tasteless. It can be eaten hot or cold. The recommended dosage of this superfood is 1 to 2 tablespoons per day. As I wrote earlier, a fruit spread without sugar can not be called "jam". In many cases fresh fruits also do not need sugar. Personally, I like sweet flavors, so I've added stevia. I used Greensweet Stevia Liquid Strawberry for this. This delicious, natural sweetener gave my jam that extra bit! Apart from strawberries and stevia, this fruit spread also contains vanilla and cinnamon. I added the vanilla because I like the taste so much. Cinnamon provides a better preservation of the substance. This spread can be stored for a week in the refrigerator. Soak the Chia seeds for half an hour in a small piece of water Mix all ingredients together with the hand blender. Taste if it is sweet enough Put the "jam" in a jar. 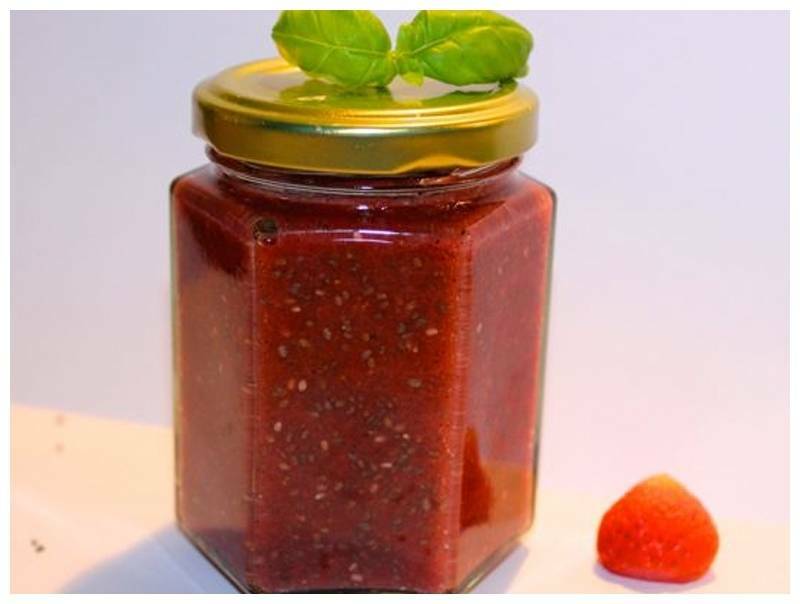 A recipe to make strawberry chia spread with stevia. This includes products from Greensweet-stevia.